This is basically to @ DC: , as I'm planning to recreate an international community I would like to know that. I don't have any stats for this, sorry. Unreal Software does not track any user information in-game. Except for the stuff which is tracked by Steam. I can only give you download stats which are not necessarily reflecting the in-game activity. It should still give you some kind of idea about the most relevant countries. You better learn Chinese and Russian. 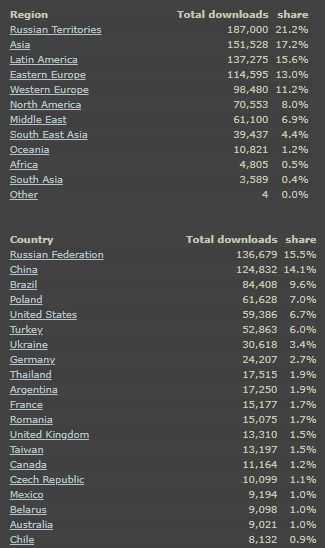 Thank you DC, looking this stats may be better to host a server in france and/or miami. How does "Russian Territories" work though. @ SQ: *cough* Crimea, perhaps?